WASHINGTON, D.C., May 4, 2011 (SEND2PRESS NEWSWIRE) — In observance of Military Appreciation Month, the Gingrich Foundation has recognized Freedom Alliance as Charity of the Month this May for the organization’s commitment to honoring the service and sacrifice of America’s men and women in uniform and their families. 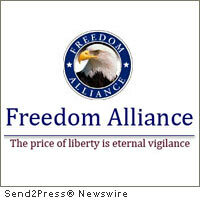 “We at Freedom Alliance are grateful and honored to be recognized in this way by the Gingrich Foundation,” said Freedom Alliance President Tom Kilgannon. “Newt and Callista understand well the importance that philanthropy and private charity play in America’s role as an exceptional nation. They provide great leadership through their personal support, and public recognition, of worthy charities. Freedom Alliance’s Support Our Troops Program provides continual outreach to America’s servicemen and women and their families, hosting various events and providing financial support to members of the Armed Forces who have been wounded in combat or who are currently serving on the front lines. Celebrating its 10th year, the Freedom Alliance’s Military Leadership Academy develops leadership skills and strengthens character, providing 14-18 year old students with a summer camp experience, grounded in military discipline, that teaches the importance of physical fitness, service, and teamwork. Freedom Alliance’s Scholarship Fund supports the children of our military heroes who have been killed in combat or who have been permanently disabled in an operational mission or training accident. Over the years Freedom Alliance has awarded over $4 million dollars in scholarships. Donate to Freedom Alliance: https://secure3.convio.net/fa/site/Donation2?idb=1888643618&1400.donation=form1&df_id=1400&JServSessionIdr004=q6g7ftw2l2.app333b . Original Keywords: Tom Kilgannon, Freedom Alliance, Gingrich Foundation, Newt and Callista Gingrich, Military Appreciation Month, Marine Corps Lieutenant Colonel Oliver North, Soldiers, Sailors, Airmen, Marines, and their families, Support Our Troops Program, Military Leadership Academy, Charity of the Month Gingrich Foundation Washington District of Columbia WASHINGTON, D.C.
REFERENCES: Defense and Military News, Tom Kilgannon, Freedom Alliance, Gingrich Foundation, Newt and Callista Gingrich, Military Appreciation Month, Marine Corps Lieutenant Colonel Oliver North, Soldiers, Sailors, Airmen, Marines, and their families, Support Our Troops Program, Military Leadership Academy, Charity of the Month Gingrich Foundation Washington District of Columbia WASHINGTON, D.C.